The name of these roses became the painting's title. 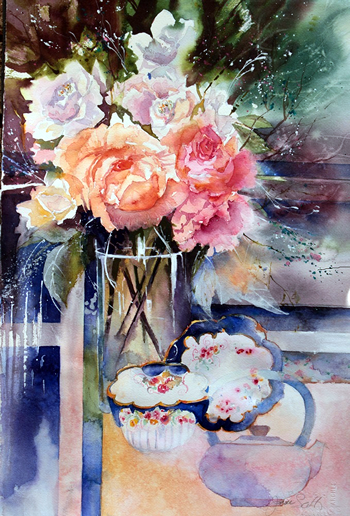 To begin, I set up roses and antique china as a the still life, drew directly onto the watercolour paper, painting first the roses, then the china and lastly background some areas with controlled mark making and some pure abstraction. All this while inhaling the heavenly fragrance that wafted through the studio! The rewards of the painting day! A trip down to the river with the grandies resulted in this painting-they were having such a marvellous time spotting the enormous jellyfish! Sketches on site were used for a painting the next day. 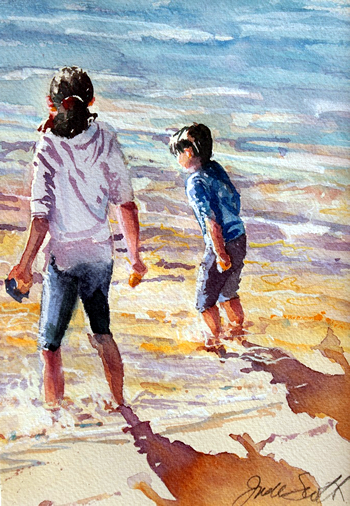 I began drawing the figures first from photographic references, flooding the background and foreground with water, dropping in the colour and allowing to dry. Then the figures and the shadows were painting as one, then after drying the darks were strengthened. Faces are fascinating and this face inspired me with my own interpretation. 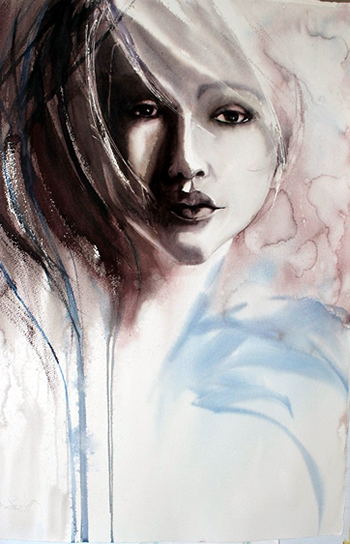 A large painting was my aim and I found such a large drawing to be a challenge as I always draw freehand, simply stretching far enough with the pencil was physically demanding! I begin with the eyes and work out from there, getting the angles of the face and the tones is vital, I painted with a soft dreamy palette to enhance her cool look and had fun with the textured background. This painting is now in a government collection in China. 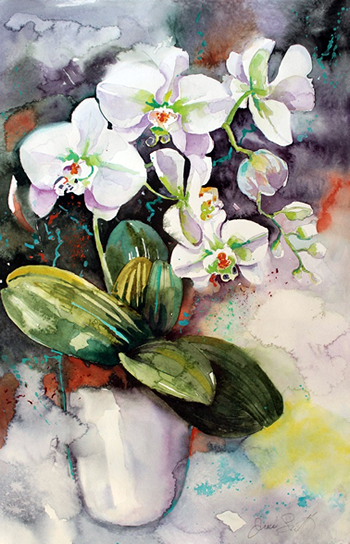 This bowl of orchids flowering in my studio was painted many times last winter, they have even appeared in Artist Palette Magazine in a feature article of mine. Setting up a still life, an underpainting for the background was blocked in first, then the flowers and the pot were completed, then the background was revisited, with loads of darks and some flashes of cobalt turquoise and splashes light red for a spritz of colour. Now in a private collection. I love sharing what I have learnt over many years of painting. When teaching it is always a thrill watching ‘the artist within’ emerge from each individual student and it is so rewarding for me! Promoting the basic essentials of painting and sound drawing is always my primary concern in class with tone, composition, drawing and design learnt, good technique always follows and this improves with practise! I always start each session with a demonstration that is completed in steps so everyone can follow if they wish, or they are free to paint a subject of their choice with tuition and guidance. I strongly encourage students to develop their own unique style of brush strokes and mark making, just relax, be brave, don’t forget to breathe and the rest will surely follow. The effort and persistence put into improving skills and technique will be rewarded, opening up a whole new world of ‘seeing’ differently, providing years of painting pleasure and the added bonus of discovering new friendships with like-minded artists!